(AFP) - Peace talks to end chronic violence in the Central African Republic began in Khartoum on Thursday, attended by representatives of the government and 14 armed groups, the UN peacekeeping mission in the CAR said. The meeting, brokered by the African Union after 18 months of exploratory work, will be the eighth bid in almost six years to forge peace. Since 2013, thousands have been killed and a quarter of the population of 4.5 million have fled their homes. Warlords will dialogue directly with high-ranking emissaries of the Bangui government, including ministers and President Faustin-Archange Touadera's chief of staff. 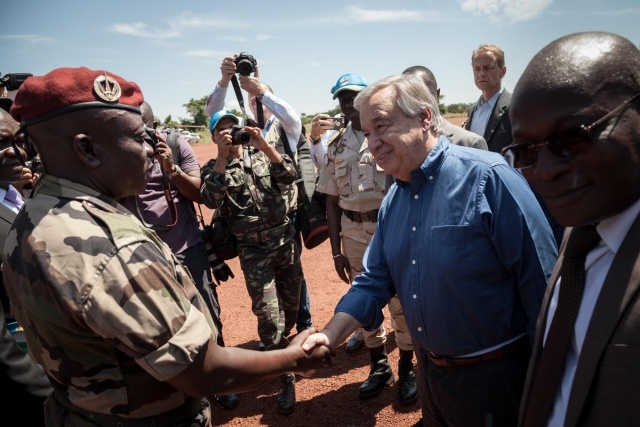 Touadera controls only a fraction of the state, despite the support of more than 13,000 troops and police in the UN's MINUSCA peacekeeping mission. The rest is held by militias, who typically portray themselves as defenders of a community or religious group but often fight over mineral wealth -- a hoard that includes gold, uranium and diamonds -- or livestock. The conflict began in 2013, when a mainly Muslim rebel movement called the Seleka overthrew president Francois Bozize, a Christian -- a move that triggered the rise of a predominantly Christian militia called the anti-Balaka. Fearing a Rwandan-style genocide, the former colonial ruler France intervened militarily under a UN mandate. The Seleka were forced from power and Touadera was elected president in February 2016. Over the years, seven peace agreements between the government and armed groups have been signed, but none has lasted. The last attempt, in 2017, was forged with the help of the Catholic Church, but fighting resumed within a day, leaving 100 dead.